One of my favorite cases for the Pixel 2 and Pixel 2 XL was Google's fabric case. However, being an official accessory, it's not cheap and goes for $40 a pop. Verizon is already offering the model for the Pixel 3 and 3 XL up for pre-order with a 25% discount, equating to a price of $30.74. I've used this case extensively on my Pixel 2 XL, and it's been one of my all-time favorites for any phone. It feels nice, it looks interesting, and it's decently protective. David got his hands on a Pixel 3 fabric case, and he says that it's slimmer and has a smaller lip than the Pixel 2's. It also looks like the bottom is better covered up. Yes, you have to wash it occasionally and it's not as resistant to the elements as a plastic case, but I'm willing to take the hit for the advantages. As of publishing time, only the Carbon (black) Pixel 3 case is ready to ship right now; all others are still in the pre-order phase. 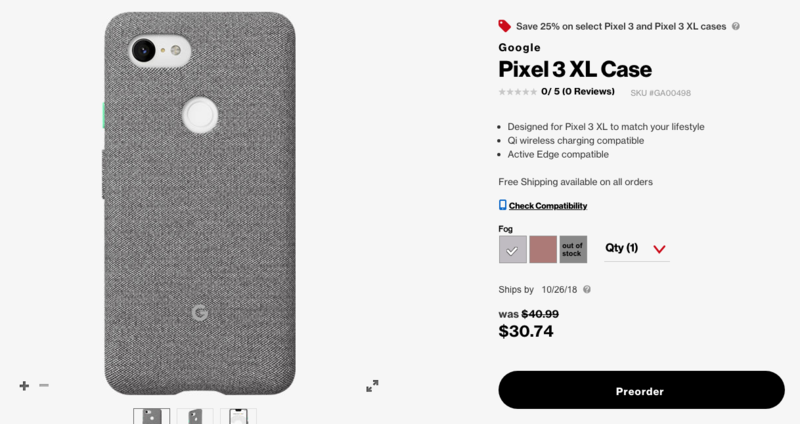 It's also worth noting that the Carbon Pixel 3 XL case is out of stock. Verizon says that this is a limited-time offer, so don't snooze on these if you're interested.